This dialog provides a means to manage palette sections. In particular, it allows to define which sections to display in yEd and the order in which the sections should be arranged. Additionally, the palette manager allows to create new sections, change the content of existing sections, and import/export sections as GraphML files. Finally, the palette manager allows to import images and/or SVG symbols into user-created palette sections. You can open the Palette Manager dialog by selecting the menu entry Edit >> Manage Palette..., respectively via the context menu of the palette that already provides convenient access to most of the palette manager's functions. 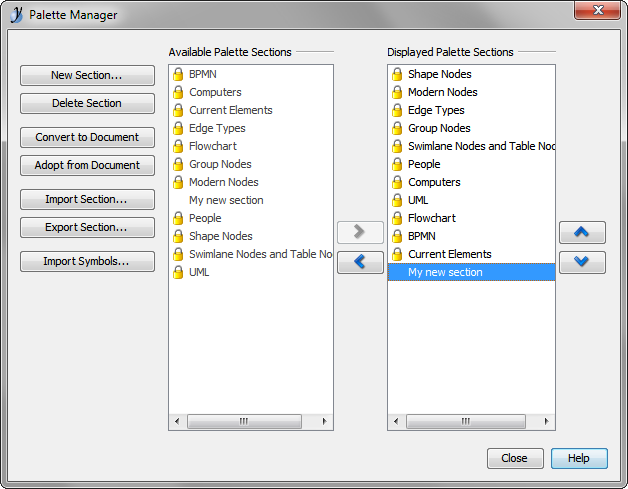 The palette manager displays palette sections by name in two lists - a list to the left showing all available sections and a list to the right showing the sections to be displayed. The default sections that are built-in in yEd are marked with a lock symbol to allow for easy distinction between predefined sections and user-created sections. The content of default sections cannot be changed. The left/right arrow buttons in between the two section lists can be used to add or remove a selected section to/from the list of displayed sections, thereby toggling the section's visibility in yEd. Visible sections are displayed in a lighter color in the left list. The up/down arrow buttons to the right of the palette manager dialog can be used to customize the order of the palette sections that are displayed in yEd. The New Section... button can be used to create new palette sections. New sections can be created as empty sections, as copies of existing sections, or as sections containing the diagram elements of the document in the active editor window. The Delete Section button can be used to delete existing, user-created palette sections. Default sections cannot be deleted. The Convert to Document button can be used to create a new document with the contents of a selected palette section. The document is opened as a new editor window, which becomes the active editor window and allows for convenient editing of the contents. For details see Editing Palette Sections below. The Adopt from Document button can be used to replace the elements in a user-created palette section with the contents from the currently active document. For additional information see Editing Palette Sections below. The elements of default sections cannot be replaced. The Import Section... button can be used to create new palette sections from GraphML files. The Export Section... button can be used to store the contents of a palette section in a GraphML file. The Import Symbols... button can be used to import images or SVG documents from the local computer into user-created sections. The button can be used to import symbols from the IconFinder icon search engine into user-created sections. Importing symbols in this manner requires a live Internet connection. 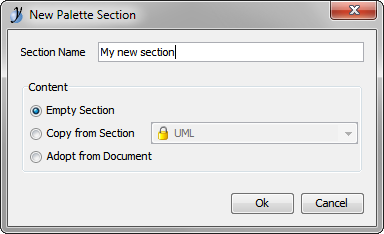 The contents of a palette section can be edited by converting the section into a document using the Convert to Document button of the palette manager. The document is opened as a new editor window, which becomes the active editor window. After doing so, yEd's graph editing capabilities can be used to add additional elements to the document, to remove elements from the document, and to change properties (such as fill color, size, or label text, etc.) of the elements in the document. The resulting document can be converted back into an existing palette section by selecting a user-created section in the palette manager and then using the Adopt from Document button to replace the elements in the selected section with the contents of the document. Alternatively, the resulting document can also be added to a new palette section, using the palette manager's New Section... button and then choosing Adopt from Document. All edges are picked up as template elements for the palette section. All nodes connected to edges are ignored. All nodes that are not connected to edges are picked up as template elements for the palette section. The order of the elements in the palette section is determined by the geometrical placement of the elements in the active editor window. Elements that are at the top in the editor window are picked up first. For elements that are approximately at the same vertical position, the elements are picked up according to their left to right placement in the editor window.